Haut bar stool is distinguished by its simple appearance, lucid construction, and harmonious proportions. 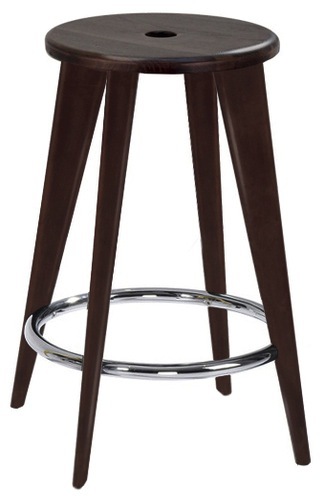 The round seat and legs are made from a solid wood in either a black or a brown finish. The footrest is in tubular steel and comes a polished chrome finish. The central hole in the middle of the solid wood seat ensures Haut bar stool is easy to lift and move around. Haut stool is a classic modern reproduction of Tabouret Haut Stool, originally designed in 1942 by Jean Prouvé.